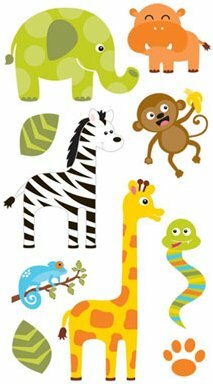 These adorable safari animal stickers are three-dimensional so they pop on your scrapbooking layouts and projects. They feature a green polka dot elephant, and orange hippo, a monkey with a banana, a zebra, a giraffe, a blue lizard, a snake and more. Great for layouts of your trips to the zoo or even your little one playing with their favourite soft toys. Size 2 1/2" x 5"